The build quality and performance are top notch and you won’t be disappointed with this keyboard. One thing I’ve reviewed a lot of here at Techaeris over the past few years is keyboards. The thing about keyboards is there are varying types of switches, especially when it comes to gaming and mechanical keyboards. When we were offered a chance to do a Cherry MX Board 6.0 review, even though it is an older model, I jumped at the opportunity. 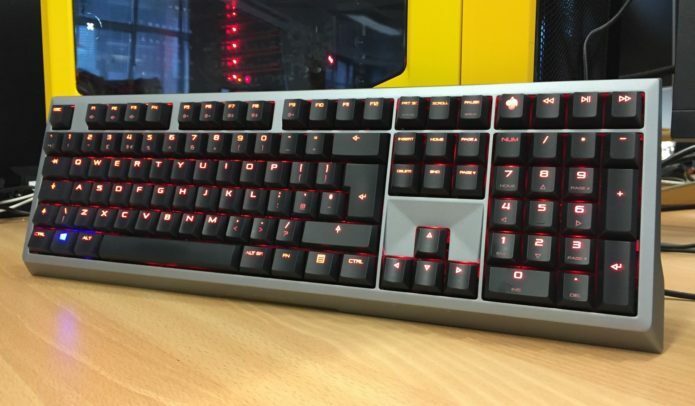 Read on to find out how a Cherry board with Cherry MX Red Linear switches performs! 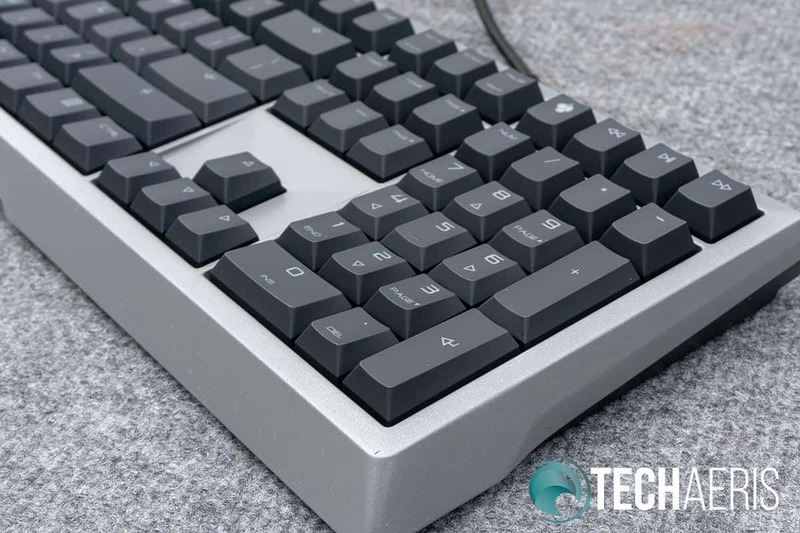 The Cherry MX Board 6.0 mechanical keyboard has a solid, almost industrial, design to it given the shape and the sanded finish aluminum frame. As a result, it’s also pretty hefty coming in at just under 3 lbs. The front edge of the keyboard is entirely aluminum with the frame angling back to a 50-50 split with the black plastic base. 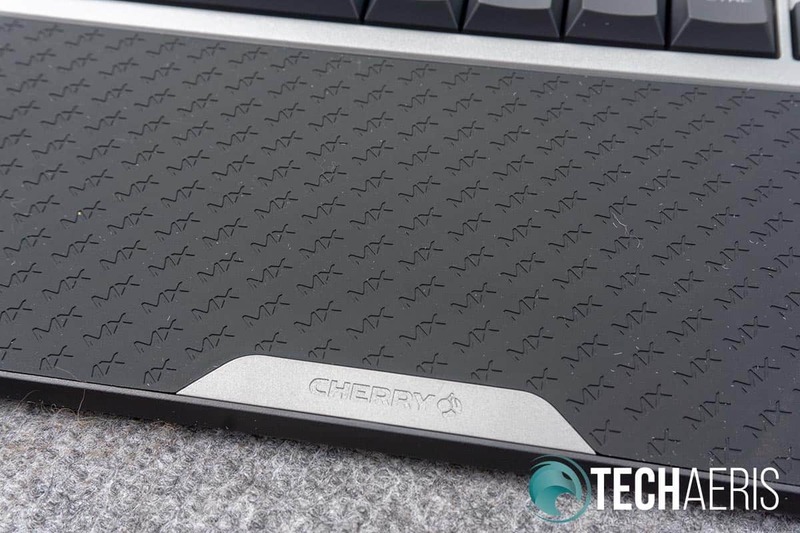 The Cherry logo is centered on the front of the keyboard just above a little cutout for the wrist rest — more on that in a moment. While the face of the frame is mostly flat, the region above the arrow keys is angled downwards, which adds an interesting look to keyboard. The front and back edges of the Cherry MX Board 6.0 mechanical keyboard. 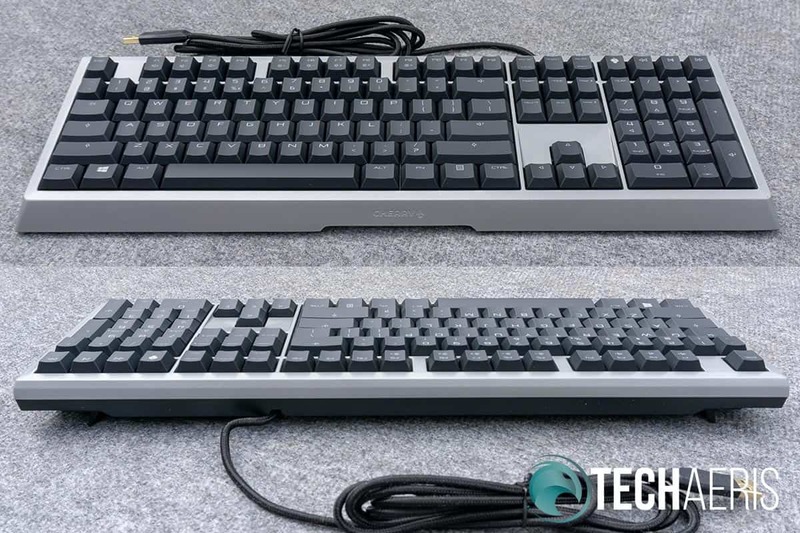 As far as keys are concerned, the Cherry MX Board 6.0 is a full-sized 104-key keyboard with four additional keys: one with the Cherry icon on it and three media playback keys. 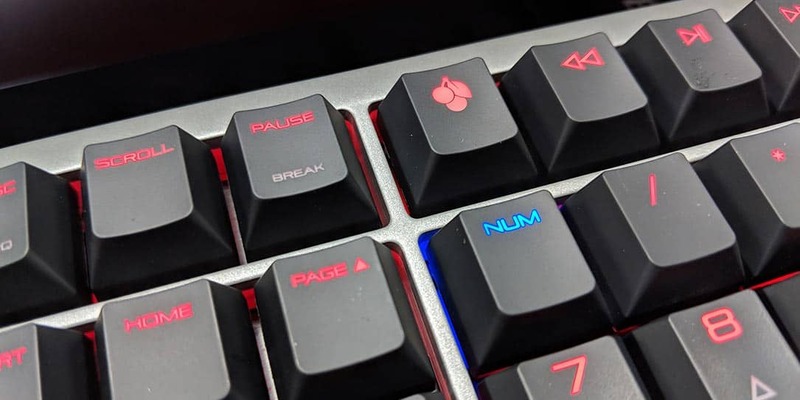 The Cherry key allows users to switch between office and gaming mode, pressing it disables the Windows key and ALT + F4, ALT + TAB, and CTRL + ALT + DEL combinations while gaming to prevent accidental toggling out of your game. The keys themselves are slightly concave, and are very comfortable to type with. The keyboard is backlit with red LEDs that can be adjusted in increments of 1% — yes 1%! — or 10% utilizing the F5 through F8 keys. When in office mode, the Windows key is backlit in blue, while in gaming mode, it is backlit in red. Both the Num lock and Caps Lock keys switch to blue when enabled as well, allowing for users to easily tell what mode and what number/caps functions are currently enabled. The F1 to F3 keys allow for volume control and aside from that the rest of the keyboard is pretty standard. A full-sized keyboard complete with number pad. 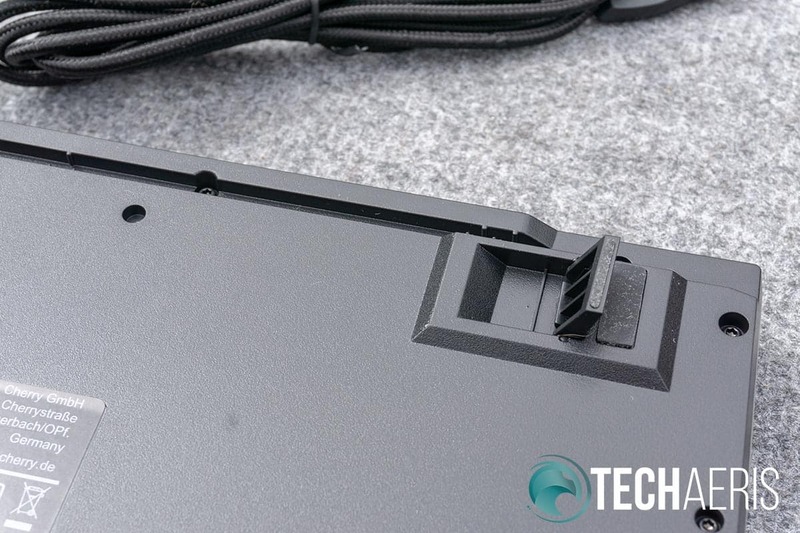 The bottom of the keyboard has two adjustable feet on either side allowing for lowered or raised back positioning. The extra long almost 79-inch (200cm) braided cable is positioned near the back of the keyboard just to the left of the main alphanumeric keys and the right of the arrow keys. The length of the cable is a bit overkill but you can be sure that no matter your setup, you should be able to easily attach the cable to your computer without worrying about distance issues. The Cherry MX Board 6.0 also includes a very nicely sized rubber wrist rest. Roughly 17 1/2-inches wide and 3 1/2-inches deep, the entire surface is rubberized with the letters MX debossed in it over and over at an angle. The very bottom has a small aluminum plate with the Cherry logo debossed in it as well to give the entire combo a nice finishing touch. The wrist rest has an aluminum plate sticking out near the bottom of the back and this goes into the aforementioned notch on the keyboard to hold it in place magnetically. The rubber surface is comfortable for all day use and cleans nicely should you get it dirty. The Cherry MX 6.0 Board with included wrist rest. While the Cherry MX Board 6.0 keyboard isn’t anything special to look at, it is a pretty solidly designed and solidly built keyboard. The Cherry MX Board 6.0 is super easy to use with no software required. The lighting, FN lock, and office/gaming mode toggle can all be performed using the Function and Cherry keys on the keyboard. You can also set the lighting timeout between 10 and 120 minutes if you’re one to leave your computer on all the time without it going to sleep. With this mechanical keyboard, all you have to do is plug it in and away you go. This isn’t my first go with Cherry MX switches but it’s possibly my first with the Cherry MX Red Linear switches. 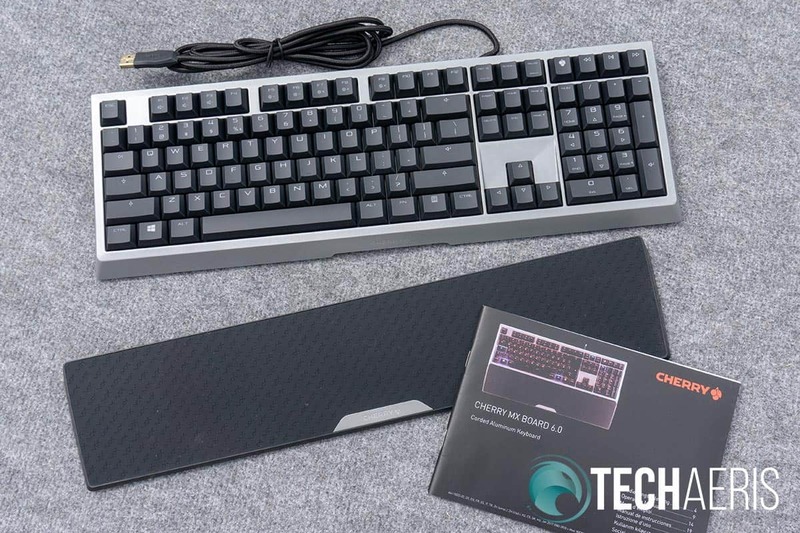 Additionally, this keyboard includes Cherry RealKey technology which provides analog processing to shorten the debounce delay from an average 20ms to a mere 1ms. Featuring a softer 45cN actuation, the standard life of each switch is 50 million key presses. At any rate, seconds after I started typing with the Cherry MX Board 6.0, I knew I’d found my new favouriteoffice keyboard. 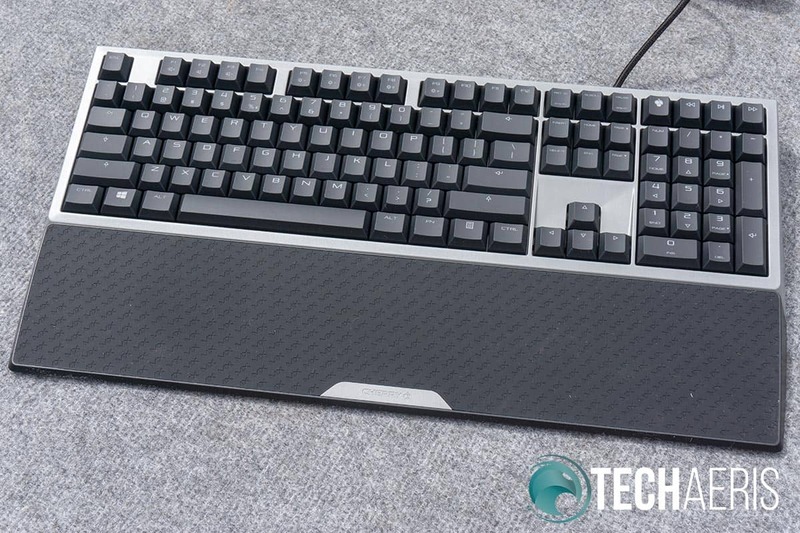 While it also works well for gaming, the keyboard is ultra-responsive and fantastic for daily typing and office use. One thing the keyboard is lacking, however, is macros. It would have been nice to see an extra row of four or five macro keys to be able to program frequently used key combinations, especially for photo editing and whatnot. Additionally, being Cherry MX Red switches, they aren’t overly clacky or disruptive in an open office environment. Initially launched for $219USD a couple years ago, the Cherry MX Board 6.0 is currently available on Amazon for just over $135USD. While there are plenty of mechanical keyboards that are more affordable, the build quality of the keyboard and performance of the Cherry MX Red Linear switches are fantastic. Plus, there’s something to be said with the inclusion of a solid, nicely sized wrist rest as well. The included wrist rest is definitely a welcome inclusion for the price. While the Cherry MX Board 6.0 is pretty nondescript looking, nothing beats Cherry MX switches. The build quality and performance are top notch and you won’t be disappointed with this keyboard if you have the money to spare and don’t require extras like macros.